I often get letters from women readers and writers telling me they were inspired by the stories in one of my anthologies. Solo is a favorite, a pint-sized book that women slip into their pack before they head out, whether to Japan or up the Appalachian Trail. And once they have finished their adventures these women often want to tell their own stories. This is a place to share stories from the outdoors, both large and small. Send your tales by email: susan@susanfoxrogers.com. If you have never written something before, don’t hesitate—I am happy to work with you. In this way, here on the web we’ll end up with yet another collection of wonderful tales of adventure (from both women and men). Thanks for sharing your story. Brian Dorsam has started a nature and science blog, Missives, about his adventures (thus far, with birds) from his home in New Orleans. Brian was a student of mine at Bard College but I can say I had nothing to do with this new passion for birds! This wonderful essay captures so much of the pleasures (and confusion) of the early days of birding. I don’t know anything about birding. I have only birded accidentally, when, by chance, I’ve glimpsed a jay on a walk through the woods or shooed a goose from my parents’ lawn, and I suppose, if you really want to get into it, that doesn’t quite count. My vocabulary for identification is limited mostly to pigeons, crows and bald eagles, and I’ve only ever encountered two of those in actual life. Now that I’m thinking of it, I’m not wholly confident that I could point out a sparrow. So, what moved me to participate in the great legacy of avian observation? Well, now, there is an air of romance about it, isn’t there? I rather liked the idea of it. I imagined myself, binoculared and notebooked, passing beneath the winter trees, ears attuned to the finest sound. I imagined gazing upward into the sun to spy a swooping egret, gliding deftly with the breeze. I imagined encountering a fellow birder on the path and saying things like, ‘A bit early for this time of year, wouldn’t you say?’ and, ‘I thought so, too,’ and, ‘Ha, ha, yes.’ I imagined all of these things. And so, with little ado and much aplomb, I got myself up early, dusted off an empty notebook and went a-birding. I aimed my stride toward Bird Island, which, I thought, seemed about right. Bird Island is a small sanctuary (about 200 feet long and 100 feet across at the middle) nestled in the Audubon Park Lagoon, a thin ribbon that lies along the eastern half of the park. It is so named because the island is known to be one the area’s most densely populated rookeries, home to nearly two hundred Great Egrets alone, and supporting significant populations of Snowy Egrets, Cattle Egrets, Little Blue Herons, Tri-colored Herons, Black-crowned Night Herons, Yellow-crowned Night Herons, Double-crested Cormorants and Anhingas, as well. I thought, perhaps, it might be cheating a bit to go to a rookery, but I supposed that this wasn’t, after all, a contest, and I figured I need not make it too difficult for myself. Seeing birds is, ultimately, the point. The park, to my great fortune, is only a brief stroll from my house, and so I set out lightly on foot. The morning was grey and damp and the air was still cool from the night’s chill. As I walked, pack at my side, I had to remind myself to look up. Perhaps it seems silly that so simple an idea would come so slowly to mind, but I fear some inborn disposition often leaves me gazing at my boots. I forced my head upward and squinted my eyes. I heard flitters and squeaks in the trees above, but found the branches too dense and my sight too untrained to notice any movement. It occurred to me that were I not going to a rookery this might be damned hard. Folks, of course, get themselves so good at this that they can identify a bird by sound without even looking at the thing. As for me, the noise is all a bit of a mess. It’s difficult to sort one call from another and the sound is often so ubiquitous that tracing the sound to a tree (let alone a branch, or an animal) is nearly impossible. I could scarcely imagine doing this in the woods, without an island to look at, equipped with only my ears, my (spectacled) eyes, and a long checklist to quantify my discouragement. People have been doing this for a long time. The idea that birds might be of some aesthetic value, in addition to nutritional value, dates back to the late 18th century. However, as ornithologists in those days had not the fortune of accompanying themselves with a binocular, they most often accompanied themselves with a rifle. This regrettable practice led, ironically, though predictably, to the severe depletion of hoards of precious species and the annihilation of many others. Even the great John James Audubon – whose name was later borrowed for our country’s preeminent environmental conservation society and, of course, for my neighboring park – made most of his invaluable paintings from stuffed corpses and indeed is most famously depicted in a wolf skin coat with his arms folded tenderly around a rifle so large that its barrel continues out of frame. It wasn’t until the late 19th century and the development of optics that ornithologists began putting down their weaponry and picking up a spyglass. This propelled a conservationist movement that helped unmake the egg, skin and feather trades, which effectively eradicated, among many others, the Labrador Duck, the Eskimo Curlew and the Carolina Parakeet, all of which were painted by Audubon. Among the early conservationists was Florence Merriam, who published the first American field guide, Birds Through An Opera Glass, in 1889. In her book, Merriam describes the opera glass as ‘the “inseparable article” of a careful observer,’ thereby, in one sentence, advancing the essentiality of optics as the primary instrument of ornithology and redefining birding as an act of observation rather than annihilation. The publishing of field guides made it possible for birdwatchers to identify birds while the birds were still in the trees, rendering their slaughter fundamentally unnecessary. It was from this movement that the National Audubon Society was formed. George Bird Grinnell (I’m not making that middle name up), angered by the avian genocide perpetuated daily by the fashion and taxidermy industries, formed the first Audubon Society in 1886, which gained an astounding 39,000 members in its first year. 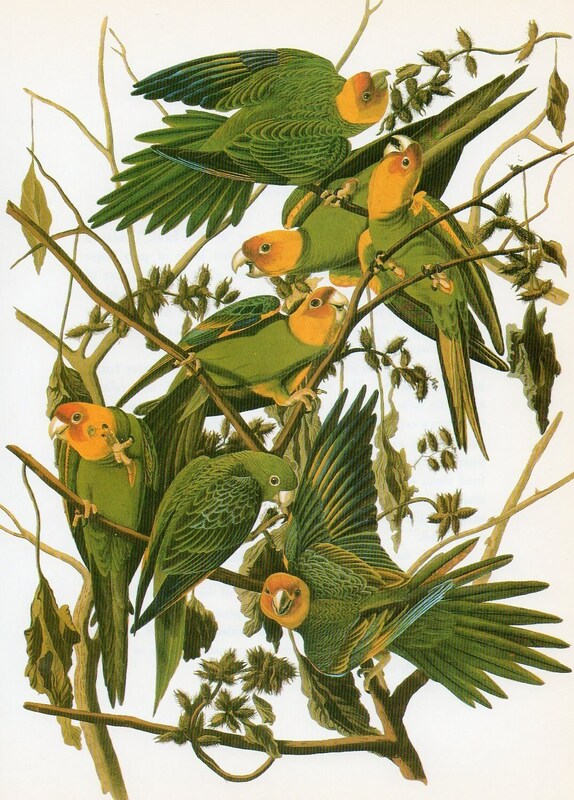 Soon, Audubon Societies were opening across the country and in 1905 the National Association of Audubon Societies for the Protection of Wild Birds and Animals was formed. The National Audubon Society is now one of the nation’s foremost conservation groups and organizes the world’s longest-running wildlife census, the Christmas Bird Count, which gathers over 50,000 volunteers annually to conduct a survey of bird populations across the world. The 112th count ended on Thursday – two days before my excursion. The Eastern shore of Bird IslandIt’s all for the best, really. I thought about counting the birds I saw, but I was unsure that I’d be able to do it before the heat death of the universe. There were surely hundreds; all of them crowded on the small islet, quarreling over the limited space. This is typical for Bird Island. However, today, there was one distinct difference: there wasn’t a single egret. Now, all birds are, of course, exquisite and fascinating creatures, archaic in make, delicate in movement and (the majority of them) endowed at birth with that most magnificent of nature’s gifts: sweeping, effortless flight. Though, it is difficult to withhold one’s partialities. I suppose there are people out there who get positively giddy at the sight of a duck, but I’m not one of them, and I’ve never met one, either. I had known the egret population to dissipate during the daytime, which made for a fantastic display at sunset when hundreds of them would soar down the lagoon and fill the trees to rest for the night. When I had seen the herons previously, I had made no note of time or season and perhaps, I thought, they’d all gone out for breakfast. I resolved myself to watching the ducks, trying to muster up some enthusiasm for the little pedestrian waddlers. The ducks hadn’t made my checklist and so I couldn’t identify them at the time. I later discovered that they were Black-bellied Whistling Ducks. The name is apt, as I specifically made note of their shrill, incessant chattering. Their appearance is quite distinct, as well. They are predominantly brown, but are grey about the face, upon which is a small but striking white ring around the eye. Their bill is a vivid orange and their feet a dull shade of pink. The tail and wings are black, though the latter is marked with a large, white streak that becomes most vibrant in flight. When they do fly, however, they are ungainly, gliding clumsily into the wind with their feet spread apart, giving the whole event a sort of, ‘Oh, no!’ feeling. They are not glamorous creatures. After I had been sitting for about 15 minutes, a woman paused on the path behind me. ‘I wish I knew where all the egrets went,’ she sighed. I turned to her and shared a solemn look. ‘They’ve been gone for a year or two, now.’ My mouth opened. She nodded and said that no one was quite sure why, but that in any event they hadn’t been seen on the island in some time. Then she left. I later found out that, in fact, the egrets have only been missing since the spring, but that the reason for their departure is entirely unknown, even to park officials. There are a number of theories, most involving scares of some kind, which all seem unlikely. There was a large storm in late March that, some say, could have spooked the birds, but, to be honest, I don’t even remember this storm, and the birds (New Orleans natives, of course) have surely seen worse. Another theory is that the ruckus from a nearby film shoot could have caused the exodus, but this seems doubtful, as the birds lived, after all, in a park, which has hosted races, parades and music festivals and supports a daily population of joggers, walkers and golfers, all within 50 feet of the island. Their sudden evacuation is particularly disturbing because they left their nests and eggs behind. That the egrets have only been missing since April is of great consequence, however, because it does not preclude the possibility of their return this coming spring. The island seems awfully bare without them. To see an island of live oaks, each leaved in purest white, lit by the glow of the sinking sun and ringing with the chatter of the spring fledglings, is, to put it at its mildest, quite something. So, I sat. I was contemplating the ducks and my sad fate, when something caught my eye from the south. It was black and lean, with its long neck outstretched. I reached into my pack and grabbed my opera glass, thinking of Florence. I pushed my glasses up onto my brow, put the glass to my eye and watched the bird fly. It settled itself on the edge of a high branch and, when I was sure it wouldn’t take off again, I pulled out my notebook. I glanced through my checklist and identified it. The American Anhinga is known by a puzzling variety of names, the sum of which provides one with a truly confounding image. Depending on whom you’re asking, the Anhinga is called either the Water Turkey, the Darter or the Snakebird. The Brazilian word from which ‘anhinga’ is derived means, rather gravely, ‘devil bird’ (emphasis mine). Suffice it to say, they are a rather absorbing sight. They are long, lean water birds, about 33 inches from beak to tail, and each feather is a sleek, glossy black. Their beaks, a soft yellow, are thin and sharp and nearly double the length of the head. The ‘snake’ allusion no doubt refers to the neck, which is lithe and sinuous. When they swim, their bodies are submerged with only their neck winding across the surface of the water. Unfortunately, this one seemed solely concerned with sunning himself. As soon as he got comfortable, he opened his wings, revealing streaks of white that adorned most spectacularly the outside of each wing. He seemed quite content in this position and, in the hour or so that I watched the bird, he changed position only once – this, of course, was a 180 degree rotation at the half hour mark to ensure that each side was sunned equally. Though I surely wished I could have seen the unique swimming style for which the bird is so frequently named, the display was impressive and, admittedly, a greatly welcomed respite from the chirping duck circus below. By the end of my stay I had seen, to my knowledge, ten different species of bird. As most of them were missing from my tragically underequipped checklist, I can only comfortably identify seven of them (remembering, of course, that many of these identifications could still be wholly incorrect) – three Blue Jays; two Gulls; five American Coots; five white-morph Greater Snow Geese; three White Ibis; a truly impossible number of Black-bellied Whistling Ducks; and, of course, the great Anhinga. Florence was right about needing a field guide. To my credit, I did try to track one down before I left, but found each of the local bookstores frustratingly lacking. By the time that order comes in and I find the time to make my way back to the island, perhaps, just perhaps, the Great Egrets will have returned. Let’s hope they’re not spooked by noise. New Orleans is kind of a music town. My camera was not quite good enough to capture the Anhinga, that dark and lissome bird, so I did things the old fashioned way. I am delighted that the first post in the Writer's Corner is a talented young woman, Carena Liptak, who was a student of mine at Bard College. Langeland is a small, flat vacation island at the southern tip of Denmark, an hour and a half from the closest major city. The residential section of the island consists primarily of beach houses, small, thinly built, and very close to the ocean. This development represents a tiny portion of the land. Most of it is beach. The part of the island that isn't beach is forest. Some beach spills into forest, and vice versa. Tough stalks of grass sprout from sand dunes, licking your calves like stinging insects. As you come closer to the shore, there are fewer of these grasses and the sand grows grainier, a graveyard of sand dollars and the gelatinous flesh of the jellyfish that are torn apart when they float too close to where the waves break. The water is beautiful and hostile, gray on sunny days and a glassy purple under clouds. It is excruciatingly cold all year round, but the Danes swim in it anyway. I did not come to Langeland to swim. I came because the wind made me sleepy. When I came to Denmark as an eight year old, to live with my dad and his girlfriend, Pia, I experienced a case of what they referred to as "Advanced Jetlag". I inverted my sleep cycle, reading and drinking tea at night and napping for most of the day. This lasted for three months, and coming to Langeland was the only trick I knew for making myself sleep through the night. Being in Denmark was difficult and lonely. I now believe that the primary reason we stayed in the country for so long was not because of any attachment Pia felt to her homeland, but for the sake of her father, a solitary man with heart trouble, who was near-canine in his ecstasy when we were with him. It was an expensive and troublesome trip. I could not tell anyone how nightmarish it became, for me, for no explicable reason, the long muddy half-dawns and the soft, incomprehensible accents of the Danes. There were enormous black slugs that boldly crossed the street in enormous numbers at dusk. I desperately did not want to squish them. When I rode over one with my bicycle tires, the grief and guilt were incapacitating. I sobbed wildly over the dead slug instead of sleeping. I knew this reaction was too silly to qualify as a reason to leave the country. For about three days in July, there was an island-wide ladybug infestation. A buzzing layer of them hovered about three inches off the ground, so thick you could hardly see the sand. Pia was thrilled; I was horrified. I imagined every step a small genocide, and after a day of fending them off, I was inevitably unnerved by finding one more--after repeated and thorough expulsions on the beach--in my hair or towel. There were hiking trails marked off in the sand, and I could climb to the tops of the dunes by myself while Pia napped by the water. The days were clear: at the highest points I could see the horizon on all sides. On all sides it was blue. The southern edge of Langeland gives into the Baltic sea. This is a strip of coastal meadow called Klise Nor, several acres sectioned off by barbed wire. The land is untouched, inhabited solely by two herds of wild Exmoor ponies that were imported from Taerø, an island off South Zealand, to keep the area cropped. The introduction of the ponies to Klise Nor was an inventive and, it seems to me, highly Danish solution to a crisis in the local ecosystem: due to the island's tourism, very few farm animals are kept on Langeland. Without grazing animals, woodlands will spring up within a few years, preventing sunlight from reaching the ground and inhibiting the insect life that several species of birds in this area depend upon. Now that the herd is here to keep the meadow well grazed, the insects are abundant, and the birds flourish. The wild ponies are also a major tourist attraction in this area, though the animals are fairly elusive. Their enclosure is large, and they have no predictable haunts within it; they apparently spend the majority of their time running together up and down the stretch of beach allotted to them. You can stand by the fence all day, waiting for the ponies to make an appearance, and see nothing but the ocean and the grass. Maybe they eventually gallop by, and pass you within seconds. They are small, shaggy animals, more adorable than they are majestic. But the collective herd, against the somewhat stark backdrop of the Baltic sea, is an impressive sight. Pia, encouraged by the enthusiasm I showed towards the ponies, engaged a woman named Melanie to teach me how to ride. Melanie owned a barn with a riding ring and a jump course and some twenty-odd horses and ponies, a couple of cows, and one cream-colored miniature stallion, who had astonishingly stubby legs and a sort of rabbit-ish cotton ball tail that bounced around when he ran. He had sired half the herd, though none of the others was quite so tiny. The stallion was, of course, not allowed to run with the rest of them, but was sequestered to a much smaller ( and comically proportionate) field, which he, to his apparent humiliation, shared with the cows. For this indignity he compensated by dashing back and forth along the fence at top speed, kicking wildly, in a somewhat unsuccessful attempt at majesty. The first pony I rode was named Bamse, which means 'teddy bear'. Bamse was a son of the stallion, and the family resemblance was striking. He was a loyal pony, but he was overweight and disastrously lazy. When other horses balked in thunderstorms or when squirrels came tumbling out of nearby bushes, Bamse stayed his course. Unpredictably, and often several times a day, however, he would make a break for a patch of un-chomped grass, drooling over the bit in his mouth, never heeding the clicks, admonishments, tugs, or kicks that might come from the rider above him. The farmer next door to the barn cut down his crops in August, so Melanie took me to the hallow field to learn to gallop. The area was flat and huge and covered with the stubble of the stalks that had been harvested. I could barely see the other end of the farm, a faraway border of trees and red rooftops. I liked to ride fast, in a straight line. The uneven parts of the ground below me blurred, and the horizon stood still, keeping its distance. I wasn't allowed to be there. I can't remember exactly why, but the farmer didn't want horses in his field. We went at odd hours in the day--very early in the morning, or in the evening after the farmer had left. The field, already a little eerie in being cut and empty, took on a bit of a magical quality at these times. The sun wasn't in the sky, and the odd color of the non-darkness hung over everything. Aside from the pony's grunts and the rhythm of his gallop, there was very little noise. There was no grass for Bamse to careen towards. It felt wilder and more dangerous than cantering circles in the riding ring; my pony thought so too. As we galloped, it felt as if he was developing a stronger purpose in running. His muscles became more compact, and he lowered his head slightly, as if he was channeling an ancestor--a common relative of the ponies from the beach, perhaps. The cold stung my cheeks and chin, and his mane whipped against my hands. One day the farmer happened to be driving past and pulled over when he saw horses in the field. In the vowel-intensive and oddly polite inflection of the Danish language, he informed us that we, on no uncertain terms, had to leave. I decided to stop riding a few weeks later. Denmark is a wonderful place to be an insomniac. Danish summers are particularly conducive to sleeplessness: they are cloudy, mild, seasonally ambiguous; in August it never really gets dark and it never really gets light. The sky looked, from the hours of about midnight to four in the morning, as if the sun was constantly on the verge of rising. Dusk began at three PM. One night, I was repeatedly awoken by an inexplicably terrifying dream about trains. I knocked on the bedroom door next to mine, somewhat pitifully calling for my dad. After some convincing, he got in Pia's car with me and we began to drive. I rolled the window down, though it was chilly; I missed the sweltering thick air of summer in America. The smells of skunk on the highway, the Toblerone my dad bought me at a rest stop, seemed too strong so late at night, and made me nauseous. We were the only car in the parking lot at Klise Nor, but day was already breaking, as much as day breaks in Langeland. The water was quiet and the tide was covertly coming in. The ponies were not asleep. In the quiet, every snort was audible as they ran along the beach. They galloped past me in a herd, no more than a hundred meters away; then, obeying some silent command, in one stride they slowed, turned, and began to run in the other direction. Carena Liptak was born in Rochester, NY and attended Bard College. She lives in New York City and is pursuing an MFA in Creative Writing at Columbia University.